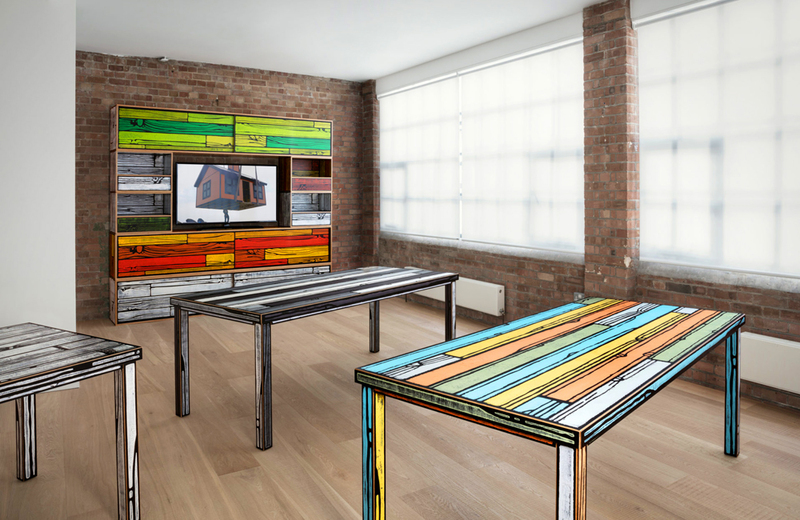 Richard Woods is the British artist and designer behind the big, cartoony, painted wood grain furniture for HAY and Established & Sons, and the forest-themed 'Tree Trunk' ceramics at Wrong for Hay. His latest installation, for the current Folkestone Triennial, consists of a series of six mini bungalows dotted around the landscape in unusual locations. Here he talks to DesignFizz about architecture, furniture and his love for wood. Growing up, did you always have an affinity for making things? Fishing was a big thing in my childhood. My dad was always preparing to go fishing and I remember being into making the fishing floats. They were shaped using sandpaper out of balsa wood and then painted on the top with bright colours. The bottoms were always painted with Rustins black satin paint. I studied sculpture at Winchester School of Art and the Slade School of Fine Art in London. I have always been a ‘maker’ and hands-on. Looking back at what I made as a student, it was always large. It always involved lots of wood and lots of paint, so maybe nothing much has changed since then! I think my work is always a cartoon. This allows it to sit physically within the real world while appearing to be visually separate from it. The works are sometimes interactive (floors, furniture). Sometimes they are ‘don’t touch!’ (sculptures and paintings). Whether you can pick them up or they are just for looking at, I think they play equally with our notions of taste and class – and hopefully have a sense of humour. After studying sculpture at the Slade, I worked as a carpenter and general builder for about seven years. That was during the early 90s and the whole world seemed to be laying laminate flooring (and I seemed to be laying most of it!). My work is a fusion of what I experienced at college and then the work I did to earn money when I left. I would laminate floors during the day and then found myself printing my own versions of wood patterns in the studio at night. I’m interested in the spaces where art, design and architecture meet. There used to be an unthinking mantra that art and design somehow needed to be separated out. This was enthusiastically adopted by commercial galleries because it’s a handy way of keeping art more expensive. It’s a dogma that’s been harmful to visual arts, so if I have an ethos of any type, it would be to keep these worlds close and not separate them. What inspired you to take part in the Folkestone Triennial? I visited the site and became excited by an idea that I felt would resonate locally and nationally. (Click here to see our post on the Folkestone Triennial). What do you reckon is the solution to holiday homes and their effect on villages? Build more wooden houses that are heated with wood-burning stoves. I am making a new public artwork commissioned by Birmingham's Eastside Projects and Banbury Council. The work involves hundreds of replica houses, copied from a nearby housing estate. Our tiny model houses will be attached to a canopy of trees in a small wood near the estate. The idea was to give the houses the best back gardens that a house could ever possibly have. 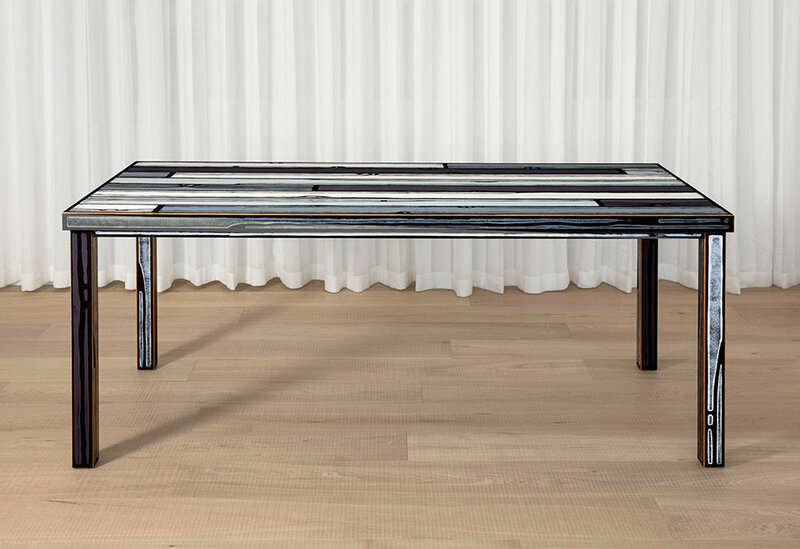 We have been working on some new tables with UK designer Sebastian Wrong. Our collaboration, which has been developing for 10 years now, is called ‘Wrongwoods’. Previewed at 2017's recent London Design Festival, they're the first new products we've made with Established & Sons for five years, so it will be really interesting to see what the world makes of them. What’s currently exciting you in design or style? dRMM's wooden pier in Hastings is great. It’s a beautiful big open space – good for running around. I love that they’ve managed to avoid all the usual, miserable retail opportunities and it makes you aware of the fantastic expanse of open sea. Where or how do you find inspiration? Walking in woods or listening to live music. We live near Epping Forest, so I can get out and hug a tree pretty regularly, and I try to see some live music at least every couple of weeks. It’s one of the luxuries of living in London. Last week we were lucky enough to catch Deerhoof, which was truly inspirational. This week it's artist Franz West and architect Kazumasa Yamashita. I'm also inspired by musicians Jonathan Richman and Richard Dawson. Anywhere with a big forest. There's a plan to take my kids over to Scandinavia pretty soon. I think we’ll find some big forests there. Instagram. I’m more keen on pictures than words. Polly Dickens is a well-known figure on the London design scene. Famous for her brilliant eye, she has travelled the world as a buyer for retailers including Anthropologie, Liberty and The Conran Shop. Now Creative Director at Habitat, she has gone full circle back to her Conran roots charting the unexpected colour combos, textures and patterns that embody Habitat's genre-hopping, global mix. Tell us about your new collection for Habitat. We’ve looked at a range of ideas for AW15 from the 1980s Memphis design movement to mid-century America, 1950s Scandinavia and modern-day Africa. Our designers have translated these ideas into a collection that ticks lots of boxes with interesting use of materials, strong shapes and bright colours. My favourite is the new 'Astrid' light designed by Matthew Long, which was inspired by DNA molecules for a simple but elegant, graphic lighting concept. His 'Hawkins' armchair is also a real statement combining an angular shape with chrome frames and mixed fabric textures (see our picks from the Habitat AW15 collection here). What aspect of the range do you love the most? That it’s brave and makes a statement. I always admired Habitat for creating designs that have a distinct personality – designs that aren’t afraid to challenge conventions and push people into looking at home furnishings in a different way. With this collection I really feel that we’ve done that again, creating statement designs that some will love and some will hate but that encourage people to be passionate and engage with design. Nobody else is doing that on the high street but it’s where Habitat will always be. How would you sum up your style as a designer? I’m not a designer as such but more of an editor – putting together designs and products for the Habitat collection and building the creative identity of the brand. For me, the provenance of a product is paramount and I’ve worked to champion ‘the hand of the maker’ at Habitat. You’ll notice, especially with our ceramics, textiles and accessories, that we’ve made sure you can see where a person has worked on a product – from brush strokes to imperfect shapes. I find that experience is my biggest influence – experiences from travels, exhibitions, trade fairs, theatre – the list goes on. I am continually inspired by people, places and things around me. These are constantly changing and translate into the collection in some shape or form. This year, the incredible Jackson Pollock exhibition at the Venice Guggenheim was the inspiration point for our Christmas 2016 collection, which we are really excited to launch. Who or what is exciting you in design right now? UK designer Aaron Probyn (left). We worked with him on a retrospective project for Habitat’s 50th birthday back in 2014 and I’m working with him again on a new collection for SS16. The way he adapts across product categories using different mediums is fascinating. We’ve just finished putting together our SS16 collection so it’s on to AW16. I’m off on a big buying trip to the Far East taking in Hong Kong, China and Thailand. We’ve worked with suppliers out there for a number of years and on this trip we’ll be looking at accessories from new ceramicists' studios, working on Christmas decoration designs and also new porcelain lighting in China. Jean Prouvé is one. I love his work and am fortunate enough to have collected several of his pieces for Vitra over the years. I’m a bit of a travel junkie. My job has meant I’ve been lucky enough to cover most corners of the globe but the one place I want to spend more time is Japan. It is such a diverse country that I have only been able to glimpse it on business trips so would love to have more time to explore. I’m also a passionate cook, so anywhere that has a good food market is on the list too. Anything from Korean-born, Brooklyn-based Jennie Jieun Lee’s ceramics collection. If you weren't a creative director, what might you have been? At university I was heavily involved with student theatre, designing and making costumes for lots of different productions. I loved it and was thinking of extending my degree into theatre design. I’m quite an ‘unsocial’ media type, however I love photography and my iPhone’s memory is always full of all the pictures I take, so I’d have to be on Instagram. Norwegian furniture and lighting designer Magnus Pettersen has a flair for combining unexpected materials – think smooth concrete and delicate mouth-blown glass. DesignFizz catches up with him at his Hackney base. What’s in store for A/W14? My 'Bell' lamp, which is an exclusive design for Heal’s. It’s the start of a great collaboration where the company is working with young designers in East London. What do you love most about the design? The combination of the smoky glass and dark walnut, and the mood it brings to your home. This design is all about reflected light. The lamp has a diffuser inside, so you don’t actually see the light source. How do you like to use lighting in your home? I use a lot of freestanding lights – a combination of floor, table and wall lamps that can be controlled individually to create atmospheric corners and moods. What is your favourite design piece? I have the 'Mayday' lamp by Konstantin Grcic for Flos, which was the first designer object I bought when I was a student. For me, it’s an absolute classic. It’s very industrial, but at the same time it works in a home which isn’t necessarily filled with industrial design. My style is heavily influenced by raw, industrial pieces but with a softer approach. It’s also a bit stereotypically Scandinavian in its shapes and production methods, but less so in terms of the use of colours and materials. Which designer has influenced you most? I admire the work of German designer Konstantin Grcic, but in general I love basic geometry and a modernistic approach. What’s the most memorable place you’ve visited? Svalbard, a small island at the northern tip of Norway, with amazing nature. It’s basically just snow and ice and is one of the few places where you can get close to polar bears. We’re renovating our home at the moment, so hopefully that will be. In future, a rural retreat would be nice. I love London but the countryside is very appealing. If you weren't a designer, what would you have been? I like the way design sits in the middle of art and business where you are creative but at the same time have to think about production budgets and whether people will actually buy the product. I can’t think of many other occupations where you get that mix to the same degree. Maybe something to do with film?